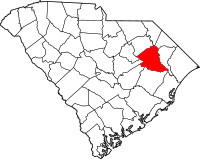 Florence County is a county in the state of South Carolina, United States. As of the 2010 census, 136,885 people lived there. Its county seat is Florence. ↑ "State & County QuickFacts". United States Census Bureau. Archived from the original on July 10, 2011. Retrieved November 23, 2013. This page was last changed on 13 March 2019, at 20:44.